"Although it was a close vote, it shows the continued appreciation our members have for the work of our bargaining committee," stated District 4 Vice President Linda Hinton. "In these tough times, our committee was able to get a contract that enhanced both our employment security and our standard of living." The contractual wage increases are retroactive to April 12, 2015, and the benefit changes do not take effect until January 1, 2016. We don't know yet the exact date when the raises will be reflected in paychecks, but expect it within weeks, and the retroactive pay a few weeks following that. As soon as we have a certain date, we will advise Local Presidents. This is a series of “Q and A” for the CWA/at&t Midwest Contract. The contract covers thousands of members in hundreds of titles and locations. Taking that into consideration, it is recommended that members look at the Q&A’s concerning the contract they work under (in our case the Midwest agreement), as to avoid any conflicting information from other contracts or inaccurate information from other sources. It is important that members evaluate the provisions of the entire agreement when considering their ratification vote. Q. What is the bargaining process in the Midwest? A. In the Midwest, we typically start our bargaining process approximately one year before the CWA/at&t contract expires. Other than staff support assigned to support the Committee, the members of the Committee are all elected by the members through their officers. The officers attended a Bargaining Unit Meeting in April of 2014 to elect who they felt was in the best position to become the Bargaining Committee for the full term of the contract. The members elected are officers who represent a wide range of titles and job functions across the five states. They are supported by their peers and sent to do the hard work of dealing with at&t in the bargaining process which, as you can imagine, consist of hundreds of hours of analyzing information, doing calculations, and arguing back and forth with their Company counterparts across the table. Q. How is the ratification vote conducted? A. The detailed summary and ballot are printed by an independent union printing shop and mailed to the last known address of each member by an outside mailing house. Ballots are returned to a P.O. Box. Locals send rank and file members to verify only members voted and count the ballots assisted by the clerical workers. No staff is involved in the process. Only votes cast by members in good standing will be counted. If you don’t vote, it won’t be counted. Q. How did the Committee categorize the issues? A. The Bargaining Committee develops their agenda from many different sources. 1) Grievances and arbitrations from the current contract to determine problem areas of interpretation. 2) District-wide Local officers meetings of concern. 3) Requests submitted by the individual members through their Locals and, this year, from the National Bargaining Council Meeting held last fall. From those sources, the Committee develops a bargaining resolution and agenda for negotiating with the Company, which was also approved by the Local officers in the fall of 2014. The Company, of course, has their agenda. Q. Why does it take months to get a TA? A. As mentioned earlier, the Company also had their agenda, which was to eliminate most of the gains made in the 50 plus year history of our contract with at&t and its predecessor Companies. There is no time limit on how long negotiations will take to achieve our goals. Q. Why are bargaining reports so general? A. In this round of negotiations, the Committee tried to have more detailed reports; however, during the bargaining process things change on a daily basis, and nothing is final until we reach a final TA. When the Committee members are elected by their peers, of course, they entrust them to be involved with all the details of bargaining, which is impossible to put in bargaining reports. Q. Why didn’t we go on strike? A. As always, a strike is a possibility if the Bargaining Committee determines that would be the only way to achieve a settlement. Strikes are not taken lightly, and the decision to call one would have to go all the way to our CWA President, per the Constitution. In this case, your Committee continued to move forward by constantly pushing the Company at the table every day, even against their will, along with the huge support of the members in D4 with their mobilization activity. Q. Why are the base wage increases always at the top step of the wage scale and exponentialized down with no change in start rate? A. The decision to put the full base wage increase at the top step of the wage scale is a simple one. All our members spend almost all their careers at the top step of a progression scale in whatever title they work in so it makes sense to put as much money as possible at the top step. Q. I was surplused and had to take a lower paid title during the last contract. What happens to my wage protection? A. All protections were continued through the new contract so members, who were able to take another job under our employment security rather than be laid off, continue their protections from the old contract into the new contract. Q. I have heard the phrase “we will be better off at the end of the agreement than we were at the beginning.” How is that calculated? A. It is based on adding up the total new dollars the member will receive over any increase in health care costs. The Bargaining Committee, in our case, worked with our lowest paid members using the family premium and paying maximum deductibles all three years of the contract to make sure that, even in that extreme, the financial package left those members better off at the end of the contract than the beginning. By working with the lowest paid, we knew all titles and wage zones were better off in either the traditional health care or the new option two, which allows for even more savings for those members and families that have lower usage in healthcare. Q. I was hired during the 2012 contract and didn’t have any employment security. What happens to me? Q. What happened with overtime in the Midwest? A. In the Midwest, all current overtime language was protected, with the exception of Appendix F which was reduced to 14 hours. Q Why are all of these comments on social media. A. Of course, everyone has a right to express an opinion, and social media outlets are a way regardless of where the information came from or whether it is fact or opinion. CWA District 4 does not use social media outlets for any contract information. Any official District 4 information will be posted to the District website, sent to officers for distribution, or mailed directly to members. Q. What is the difference between the core contract and the appendixes? A. The name of CORE is used for a few different things. It is used to distinguish the main Midwest Contract from others in the Midwest, such as Mobility and Internet Services. It is also referred to as the old regulated side of the business or the “Traditional Telephone Work.” The Appendixes are supplements to the core contract, such as Appendix A (MOA’s) and Appendix B (titles and wages). The newest appendixes F & G are supplements for particular product lines in which the Company wants to compete or used to be referred to as the unregulated side of the house. Q. Why weren’t the appendix (F) members brought into the core contract? A. This Committee tried to get the Company to move on this issue. However, it was an issue we were not able to accomplish. The Midwest Committee made the decision to address the concerns and demands our Appendix F members had rather than continue to try and place them in a different part of the contract with their concerns not addressed. The Committee was successful in protecting the gains made in the two previous contracts, in addition to addressing their key demands surrounding quality of life issues. As mentioned above, in addition to lowering the cap on the unreasonable amount of mandatory overtime, the Appendix F members now have additional days which count toward the calculation of overtime, additional MOA’s added, including full access to both the Midwest staffing system and the National transfer system, which they previously had limited access. An additional demand time off was negotiated and additional pay for PremTech and Dispatchers prior to the GWI increase. The additional job duties for PremTech include Pair Changes, limited fiber cross-connects and fiber drops. (Excluding Fusion Splicing, which remains Top-Craft work) and Bridge Tap Cancellation devices, (excluding splicing them into cable pairs.) For the first time, the Job Duties will be part of the negotiated letters, which means they can’t be changed without negotiations, as in the past. Q. What changed with attendance? A. All current employees will have the same language as previously, including the Common Attendance Plan, which the Committee was able to protect. Anyone hired after ratification will have up to 40 hours paid personal illness hours per year. Q. What Holidays did they change? A. The holidays in the Midwest contract did not change and continue through the term of the agreement. Q. What about SSP going forward. A. As a result of new regulations in the Affordable Health Care Act and IRS guidelines, members will receive awards in cash. Q. Is the 2015 wage increase retroactive? A. In the Midwest, the 2015 wage increase will be retroactive if the contract is ratified on or before June 26, 2015. Q. Why doesn’t the Company negotiate for current retirees? A. Current retiree issues, by law, are a permissive subject of bargaining and not a mandatory subject of bargaining. This simply means that both sides have to agree to negotiate over those issues. The Union Bargaining Team constantly demands to bargain for retirees and, of course, the Company refuses. In this round of bargaining, the Committee –with the help of our District Vice President – was successful in getting the Company (outside the formal bargaining process) to commit to funding the HRAs in 2016 for Medicare eligible retirees at the same level as 2015. Non-Medicare eligible retirees will continue to have benefits available to them at the same level as current employees. The Company also committed to discuss them with the Union for future years. Q. AT&T makes a lot of money. Why is it so difficult to negotiate with them? A. Unfortunately, at&t, like any other corporation, is profit-motivated and shows most of its loyalty to its shareholders and leadership. One of the most difficult responsibilities of any Bargaining Committee is to take on the balancing act of improving our members’ and families’ standard of living while protecting their employment security and keeping as much work in the Midwest as possible by not pricing ourselves out of the work. Technology will continue to change our members’ jobs and the work they do. The elected Bargaining Team pushed extremely hard to maintain what we have, along with making improvements over the previous contract in wages and keeping health care cost shifting to the lowest it’s been in years. Q. Does the Committee recommend ratification? WE HAVE A TENTATIVE AGREEMENT!! At this time, the Midwest bargaining team is still at the table in negotiations with the company in effort to reach an agreement. Progress is certainly being made and the team will continue to hammer out a fair deal throughout the evening. We will report any new developments as they transpire. The Company spent the majority of the day in communications with bargaining chair Jerry Schaeff and Vice President Hinton on the current status of negotiations; among other issues. The bargaining team intends on meeting with the Company tomorrow anticipating a new attitude toward compromise and a real focus on reaching a fair agreement. We will see. It goes without saying; the bargaining team appreciates all of the support they continue to receive from the membership. Negotiations never go without its challenges and we will get through this round as we have in every round that preceded it. Continue to mobilize while your bargaining team continues to fight at the table and we will bring home a fair contract! Efforts made by the bargaining team to reach an agreement yesterday further exposed the Company’s unreasonable and uncompromising attitude. Therefore, the bargaining team will continue to fight back, with the support of our membership, and hold the line for a fair agreement. Today, our leadership and bargaining team will be holding a call with Local presidents to determine our next steps. Locals should keep the heat turned up and demand the Company bargain a fair agreement! We will not back down! Stand in solidarity; stay mobilized and ready to roll! The Bargaining team has been spending the majority of their time painstakingly working on Healthcare and benefit proposals. The process is complex and the bargaining team is making sure to work through every scenario and option available to deliver the best provisions at the best value. Make no mistake; the task becomes even more challenging when the Company insists on greater cost sharing and trying to bargain now for possible changes to healthcare tax codes which may or may not even affect our plans. Ultimately, our benefit plans work hand in hand with healthcare and what will eventually be part of the final economics of the agreement. Though it may seem we are in somewhat of a “holding pattern” at the moment, reminiscent of the end of our last round of AT&T Midwest bargaining, this is not the case. The bargaining team continues to grind away at proposals and options available that are in the best interests of the members who elected them to be at the table. They appreciate your support and trust to bring home a fair agreement when it is reached…but not a day sooner. The only thing that can help expedite reaching an agreement is the continued pressure of a mobilized membership! You have been doing an incredible job with mobilization...we have to keep it up! All of our options are still available. Over the past few days, members of CWA District 4 continued to hold the Company’s feet to the fire with incredible mobilization activities across all five states. The bargaining team appreciates the impressive display of support and asks members to keep it up as they continue in the fight to bring home a fair agreement. As reported before, some major items are still out on the table. We’ll continue to battle through these important issues (Appendix F, Health Care and Benefits, etc…) with the support of our members and leadership. D-4 Vice President Hinton has been standing side-by-side with the bargaining team supporting them through these tough negotiations, just as the “fired- up” members are out in the field. Solidarity will see this through! Don’t let up with the mobilization efforts…it is what keeps things moving forward at the table! We still control the clock and the Company knows we will do whatever it takes to get a fair agreement! Talks continued today between the parties and progress is still being made. The major issues left at the table are Appendix F and economics (pensions, healthcare benefits, and wages). We still have a long way to go! Though the bargaining team has been away from home and at the table every day since March 2nd their resolve hasn’t diminished. They’ll continue to fight for a fair agreement as long as it takes and appreciates the support the membership has given them. Today was a much more productive day at the bargaining table. Your bargaining team was able to secure all provisions of the ESC and EEOP, retained current contract language for required overtime (core), common attendance policies, successorship, and other important articles of the agreement. The team further held its ground and improved vacation availability for our Home Solutions Centers and achieved some improvements for members covered under Appendix G. Positive strides were made on the benefits front today as well. The appendix F committee will be working on counter-proposals to the company’s last, which will be the main focus when the team returns to the table. Though progress is being made…do not let up on the pressure. Stay mobilized! The Company had no proposals for the bargaining team and spent the better part of yesterday away from the table. There are many important issues left out there and the bargaining team is fully prepared to address each of them…it’s up to the Company to make that happen. Hopefully today there will be some movement. The majority of the outstanding issues could be resolved if the Company would come off of their retrogressive proposals and retain current contract language. The team has made it abundantly clear; we will not retreat from current contract language! The team will keep the heat on at the table; the members should keep the heat up in the field! We’ll let you know what transpires today! As the Bargaining Team works on proposals for the remaining outstanding issues, it appears the Company has decided to coast today. While claiming they want to expedite reaching a final agreement, their actions suggest otherwise! As Vice-President Hinton said on our President's call yesterday, this bargaining team will continue to work hard to bring home an agreement, but we will not let this drag on indefinitely. All of our options are still in play! The Company can either spend time working to reach a fair agreement, or they can spend time scrambling like they did on Tuesday! It’s their choice! Stay mobilized, Stay fired up, and Stand in Solidarity! The decision to work without a contract is not a sign of weakness or backing down, it's quite the contrary. Bargaining is about movement at the table...mobilization (like the actions our members have participated in) is what keeps things moving forward at the table. A strike is utilized when talks have stopped. Striking while progress is being made does not make things move faster; rather it puts in jeopardy all TA's that have been reached. In the simplest of terms, bargaining is like a flowing river...mobilization keeps the river flowing, if the company stops talking, in essence becoming a dam...that is when a strike becomes necessary (the dam buster). With positive movement taking place at the table, the Midwest Bargaining team has made the decision not to extend the 2012 AT&T Midwest CBA but continue working and bargaining without a contract. The Company will need to prove to the bargaining team that productive talks will continue on the path towards a fair agreement. Your actions have shifted the power to the committee and we have taken control of the clock. Members should continue to work, work safely, and keep in contact with your mobilization coordinators! Stay Mobilized! This fight is not just about our contract…it’s about RESPECT IN PEOPLE ! Again, the Midwest Bargaining Team appreciates all of your support! Keep up the great work! The bargaining team is still at the table. Movement is being made but many major issues are still hanging out there: Healthcare, Pensions, Appendix F, Employment Security, and Wages. The Clock is ticking…it’s time for the Company to stop wasting time posturing and start bargaining! The team will continue through the night working to reach an agreement…but if it doesn’t happen, we will do what we have to do! We will report any major developments throughout the evening and tomorrow’s expiration. AT&T’s catchy slogan “rethink possible” should not mean rethink how to get more money in the pockets of executives on the backs of our members. It is apparent at&t refuses to acknowledge the fact that, customer loyalty is only a result of the work our member’s do, not the catchy commercials, managers, and members of at&t’s leadership team who have never met a customer face to face. With contract expiration looming…the Company refuses to move off their retrogressive proposals on all major issues. These are just the changes to the major issues! The company is making no effort to bargain a fair deal in the Midwest. They show no respect for the bargaining team or the 17,000 employees that work hard every day making AT&T profits; they end up throwing away on bad deals (T-Mobile $4B) and fines ($65M in legal fines). It is almost laughable! While the bargaining team is fighting at the table our members are mobilizing in the field in a BIG way! Both AT&T Midwest and Legacy T voted overwhelmingly to authorize union leaders to call a strike if a fair contract can’t be reached. Today, the CWA Executive Board has approved that action. AT&T has been put on notice: We will continue to talk…but we are ready to walk! Yesterday, our local presidents participated on a call with D4 Vice-President Linda Hinton and the Midwest bargaining team. The call opened with a few words from VP Hinton about bargaining, followed by a report on mobilization, and a status report from bargaining chair, Jerry Schaeff. The message was straight forward and to the point…we have a long way to go in reaching a fair agreement. All of our major issues are still on the table and the Company refuses to come off of their retrogressive proposals. Freezing pensions (eliminating them for new hires), dismantling employment security, cost shifting health care, refusing to talk about upgrades while increasing duties, and the list goes on and on. At&t shows little respect for the bargaining team at the table or the thousands of members that get the job done every day. Though time may be running out to reach an agreement before expiration; this bargaining team isn’t going anywhere until a fair agreement is reached! With the overwhelming results of the strike vote, the team knows the membership has their back and is ready for a fight! With each tick of the clock and every retrogressive proposal that gets passed…a fight just might be what it takes! TURN UP THE HEAT…OR IT’S FEET ON THE STREET! The weather report in most areas looks like managers should get their branded rain apparel ready! Members show support of the Bargaining Team in a BIG way! CWA members are ready to do whatever it takes to support the bargaining team in bringing home a fair agreement; and it’s going to take the action of our membership to make it happen. Follow your Local Mobilizers’ instructions on what actions you should take. Monday proved to be another non-productive day of negotiations. The Company continues to hold their positions on each of the major issues…all are retrogressive. It appears the Company is struggling with how bargaining is supposed to work and what it takes to put together a deal. Every member needs to let their managers know that this one-sided effort at the table is unacceptable and we will do whatever it takes to get the Company to move in the right direction. The mobilization coordinators will be in contact with our locals…it’s time to step it up! SOLIDARITY! With less than a week to go, the bargaining team is working hard to bring home a fair agreement. The Company seems to have forgotten that it takes both parties to make that happen. After a week of bargaining into the evening hours, with little or no progress to show for it, the bargaining team made the decision to work away from the table today. Though the company claimed they intended to work through the Holiday, holding the bargaining team hostage at Hoffman Estates only to pass a few uncontentious proposals has little to do with reaching an agreement; and everything to do with power. The team will work in the “war room” today preparing for what we hope will be a more productive Monday. Testing the resolve of the bargaining team with a week to go; bad move on the Company’s part. The team is in this for the long haul and prepared to do whatever it takes, for as long as it takes, to bring home a fair agreement to our members. More of the same on April Fool’s Day…and it won’t strike a chord of laughter among the members! Without a doubt, the Company only has interest in bargaining over THEIR issues and continues to marginalize and disregard each proposal the committee presents. The bargaining team is requesting locals to immediately step up their mobilization. Strike authorization results need to be into the District office by Monday and all local preparations need to be squared away. It’s going to take a fight to strike a deal this go ‘round! There is little progress to report from the bargaining table. It is becoming abundantly clear the Company somehow has come to believe we are here to bargain in the best interests of AT&T. As far as the best interests of the employees...the Company has yet to agree to one provision which provides any improvements beyond current language; the majority of their proposals and counter-proposals are retrogressive. So, with little progress to report, locals should focus on mobilization and preparing our members for what we will need to do to move this Company at the table. Strike vote tallies need to be submitted to the district office by the 6th and locals should be finalizing their picket duty assignments. Members need to remind management that this bargaining will not be one-sided and we will do whatever it takes to get a fair agreement! Today at the bargaining table, the committee passed more proposals on healthcare benefits and pensions. On the healthcare front, the company offered a presentation about their “Your Health Matters” wellness program. The committee was quick to point out during negotiations; with the company’s healthcare plan the savings “wellness” plans yield (which have never been tracked) would not be shared with the employees. In other words, they like us to share in the cost…just not the savings. As far as pensions go…the bargaining team again heard the familiar sound bite;” The Company has no intent or desire to bargain for current retirees”. Bargaining chair Jerry Schaeff challenged the Company’s committee by saying “So basically, AT&T does not care about the employees that built this company!” As would be expected, there was little response…that is until later in the day. The Company went as far as to call the entire bargaining team back to the main table only to pass the union’s Retiree Pension proposal back to us…refusing to bargain any issues related to current retirees. NO RESPECT IN PEOPLE! R.I.P. The team wrapped up the afternoon by meeting with the Leveraged Title sub-committee and the Healthcare sub-committee. On a lighter note: as the photo shows, Flat Randall made an appearance at the bargaining table today! Mar 20, 2015 The company’s need for “flexibility and cost savings” regarding every issue at the table since March 4th gives new meaning to “MARCH MADNESS”! Negotiations continue at the AT&T Midwest bargaining table. The bargaining team and company continue to pass proposals across the table, as well as meeting with the various subcommittees. Topics including Appendix G, Vacations, Holidays, and many of our MOA’s within the agreement have been the recent focus at the main table. Today, the Company responded to the Union’s ideas about health care focusing on prevention and maintenance for savings rather than cost shifting to our members. The health care sub-committee is meeting this afternoon to further discuss the issue. The bargaining team continues to drive the message home; “discussions about health care which only look to save the Company money by cost shifting are unacceptable.” It’s time for them to step up to the plate and have real discussions about the future of healthcare for our members. MOBILIZATION: Locals are doing a great job with their mobilizations. Every opportunity should be taken to let management know that the membership is 100% behind their bargaining committee. The bargaining committee met with the Company yesterday as did the sub-committee for Appendix F. The committee continues to work on proposals based on the surveys as well as counter-proposals to the Company. Today, the team is again meeting with the Company at the main table with meetings of the sub-committees to follow this afternoon. The bargaining committee wants to say "thank you" to Locals who have sent care packages to them during negotiations. Continue to support your bargaining team with local mobilization activities focusing on respect in people. Today at the bargaining table proposals were passed across the table addressing vacations, excused workdays, and holidays. Following discussions at the main table, three of our sub-committees are meeting with the Company: call-center/consumer, employment security, and benefits. The bargaining committee will continue to work on proposals and responses to what the company presented to them. Today in bargaining the Company made it quite clear to the committee they have no "desire" to negotiate over benefits for current retirees. If the Company's position makes you SICK...we'd agree! Even worse, if the Company had it their way, you might not have a sick day to use to recover! Yes, today the Company came after Article 18 (sick days) as well. The appendix F sub-committee met with the company today to begin addressing issues of the three titles covered by the appendix. Tomorrow, other subcommittees will be meeting with the Company, as well as, the entire bargaining team at the main table. AT&T JUMPED into the security business with Digital Life but in bargaining DUMPED security for their employee’s life…specifically JOB SECURITY and FINANCIAL SECURITY. On Tuesday, the Company followed up their disrespectful benefits proposal by taking a carving knife to the heart of our job security. Their proposals would slice pay protection provisions from Article 26 and eliminate Employment Security Commitment, Extended Employment Opportunity, and Pooling of Titles MOA’s. Clearly, the Company is more interested in the flexibility to let go of employees rather than the “World Class Customer Experience” our members provide… or preparing them for the “jobs of the future” they keep telling us about. Today, the bargaining team countered the Company’s benefit proposal with a plan that protects our health care and focuses on cost efficiency not simply cost shifting. The bargaining committee is committed to protecting and improving healthcare benefits for active and retired members. Today, the bargaining team turned their backs to the proposals that lack respect in people. They'll be back at the table tomorrow to continue the fight for a fair agreement! Today in negotiations, your bargaining team presented the Company with twenty-one proposals. During talks, parties were able to reach agreement on three of these and four earlier proposals from March 6th. This afternoon, the benefits sub-committee will be conferencing with the research department and Legacy T to work on a response to the unworkable, first proposal from the company with regards to healthcare and benefits. The bargaining team will continue to work on our proposals and responses to the Company’s. Thursday, your bargaining team worked on proposals based on the bargaining requests and surveys submitted to them by members and Locals. Today (Friday), talks opened with a presentation from the company discussing healthcare, benefits, and retirement costs. Within an hour of the company assuring the committee of their continued commitment to “provide excellent middle class union careers with highly competitive wages and benefits”; they presented one of the most retrogressive health care and benefit proposals seen in decades. The bargaining team made it abundantly clear; health care and benefits are of the highest priority to our members and proposals like these do not live up to the Company’s rhetoric or their claimed commitment to bargain a fair contract. The bargaining team will continue to work on their proposals and prepare for bargaining and meetings with sub-committees next week. 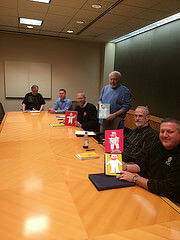 Yesterday, the District 4 Bargaining Team met with the Company at their Hoffman Estates facilty. District 4 Vice-President Linda Hinton and AT&T’s VP of Labor Relations Randy White, each shared opening remarks to kick off bargaining. The Company expressed what they considered to be their biggest challenges in the current business environment. New competition from large, established companies -- Google, Dish, Walmart and others -- entering the marketplace. Customer choice and customer demand for high quality service and products. Vice-President Hinton was very clear in her remarks to the Company…this round of bargaining is about moving forward and that “it’s our turn”. She went on to remind the Company that we need to secure jobs of the future, to provide health and retirement security to all members, and fight for fairness and respect in people. She continued, " It’s time for the Company to have the vision and courage to think out-of-the box" when addressing issues vital to this round of bargaining. VP Hinton recognized many of the challenges facing us during these negotiations but concluded by telling the company we are committed to work as hard as we can to reach a settlement we can recommend to our members. Your 2015 D-4 Bargaining Committee (Tim Strong, Mike Hanley, Diane Bailey, Dan Frazier, and George Walls) is prepared to do whatever it takes to bring home that agreement. The team is scheduled to meet with the company Thursday morning.